One of the newest developments is conceptual approval for light on the Southwest Waterfront’s Case Bridge, being executed by the French company that brought lighting to the London Bridge during the 2012 Olympics. (If they could put lights on a bridge that is constantly falling down, we think they can handle Case Bridge.) 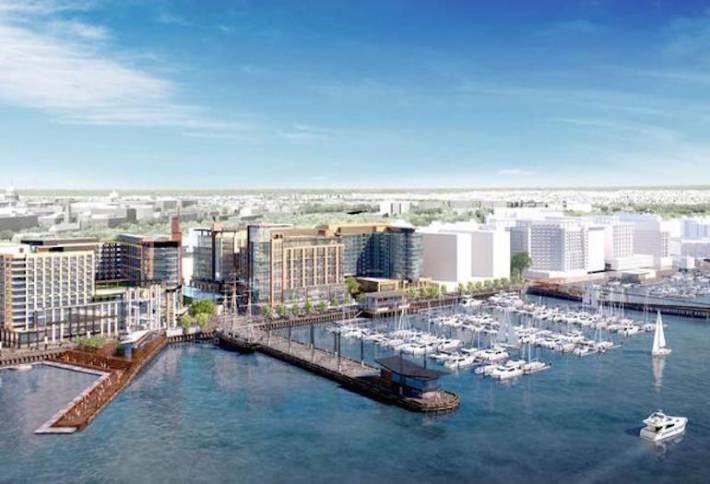 Among our speakers, PN Hoffman CEO Monty Hoffman (whose company, with Madison Marquette, is developing the $2B The Wharf) tells us the approval process has taken nine months, a blink compared to other aspects of the project. The company will use all LED lighting along the bridge and roadway platform. The Case Bridge is an artery into Virginia and carries 170,000 cars daily. Monty tells us he’s also working with National Harbor, The Yards, Old Town Alexandria and Georgetown to get an expanded water taxi service to link all the waterfronts. He envisions an Uber-like app that lets riders visually see the location of the boats and provide ETAs. A free ferry between the Waterfront and Hains Point will be ready to go by Cherry Blossom season 2017. Monty says he envisions office workers hopping on the ferry to hit balls at the Hains Point golf course. Grosvenor Americas has 325 apartment units with 25k SF of retail coming to the Waterfront in early 2017, says SVP Don Capobres, who will also speak at our event. Who will fill that space? Millennials, of course. Don says they’re a generation that’s cost conscious (45% of them have moved three times in the last three years and 35% have moved twice), so pricing will be a factor. The units are smaller, so the gross cost to the tenant is less and some of the amenities in the building will compensate for the lack of space. Tenants can share lounges that can serve as living rooms and it’s (so far) the only residential project that has Nats Park views from its rooftop. The company plans to augment the views with large TV screens. Millennial Week is a weeklong celebration in Washington DC that provides a social and cultural platform for millennials – those born between 1977 and 2001. The millennial generation is the largest generation in the United States and is significantly contributing to the growth of the population in the District of Columbia. Many local businesses and entertainment venues are catering their products and services to meet the needs of this growing demographic. Millennial Day of Service – Saturday, June 13, 2015, 10 a.m.-1 p.m. Turner Elementary School, Washington DC. Volunteers will take over DC middle schools to distribute 1,000 books to 1,000 kids, revamp libraries and paint murals. Mantras & Martinis – Sunday, June 14, 2015, 6- 8 p.m. The Loft at 600 F, 600 F St. NW #300, Washington, DC. Relax and connect with a session of feel good yoga at Grip the Mat followed by a cocktail reception. All levels welcome, but attendees must be 21 or older. Yoga mats are available to rent for $2; email info@gripthemat.com to reserve one at least 24 hours in advance. Millennials, Diversity & America – Monday, June 15, 2015, 6–9 p.m. Washington Post, 1150 15th St. NW, Washington DC. The past year has pushed issues of race, civil rights and diversity to the forefront of American society. This forum will engage journalists, legal experts and community activists on issues including civil rights and the role of Millennials in leading social change. Millennial Hiring Fair – Tuesday, June 16, 2015, 1-4 p.m. The Woolly Mammoth, 641 D St. NW, Washington, DC. Millennials continue to face one of the highest unemployment rates of any other demographic. The Hiring Fair will allow attendees seeking new careers or career advancement to connect with recruiters from Wells Fargo, Mass Mutual, the American Society of Association Executives, and more. The Startup Lounge – Tuesday, June 16, 6-8:30 p.m. The Loft at 600 F, 600 F St. NW #300, Washington, DC. Strategize, network, socialize. The event is a place for Millennial entrepreneurs to network, engage and build awareness for their emerging enterprises and start-up ideas. Attendees can speak with financial advisers and professionals one for advice on business development, banking and funding. Entrepreneurs’ Forum: Raising Capital – Wednesday, June 17, 2015, 6:30-9 p.m.1776, 1133 15th St. NW, Washington, DC. This panel will explore ways to find and secure funding, and discuss challenges that are specific to Millennial entrepreneurs. The Innovation and Entrepreneurship Forum – Thursday, June 18, 2015, 6:30- p.m. 1776, 1133 15th St. NW, Washington, DC. Entrepreneurs and innovators from global corporations will discuss the challenges and opportunities related to starting new companies and working within corporate structures. The Founder’s UnConference – Saturday, June 20, 2015, 9:30 a.m.–3:00 p.m.1776, 1133 15th St. NW, Washington, DC. This event will convene inspiring founders and aspiring entrepreneurs to discuss topics including: running a lean start­‐up, building an online brand, intellectual property for entrepreneurs, attracting corporate sponsors, and more. DC Curbed gives the best neighborhoods for renters. Check out the article below. Washington, D.C. is a big and beautiful city that spans four quadrants with over 100 distinctive and unique neighborhoods. If you’re interested in moving to the District or moving from one are to another, here is your guide to where the most livable and most rentable areas are. To make this list, Curbed took a look at the median rents in each area, the Walk Scores, and the communities that inhabit them. In only a few words, Curbed summarizes what you should expect to find in each neighborhood, whether that’s an active nightlife or swanky designer stores. Feel free to leave your suggestions in the comments on any neighborhoods we left out, but shouldn’t have.